We manage and own over 337 kilometres of railway corridors, making up about 80 per cent of the total railway network that our trains regularly operate on. By properly maintaining the nearly 500 km of track within these corridors, we help ensure that every week approximately one million train passengers get where they need to be going, safely and reliably. Our safety priorities include preventing trespassing, clearing vegetation within corridors, garbage removal, and graffiti management. We also work with communities on anti-whistling initiatives. Safety is our number one priority, and bells and whistles play an important role in helping to keep people out of harm’s way. Bells and whistles are used for different situations. 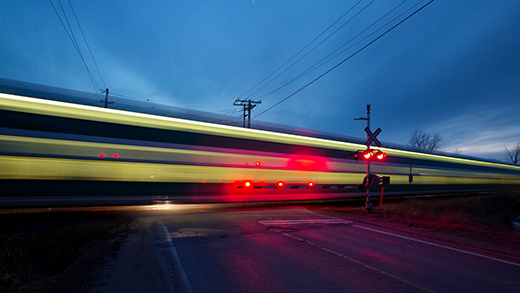 We follow safety rules set by Transport Canada for sounding these warning signals—they're only used when necessary and when we’re required by Transport Canada’s Canadian Rail Operating Rules (CROR). If you live near a rail line, you can expect to hear some train bells and whistles. Anti-whistling measures depends on the railway design speed, how the crossing is used, and the warning systems in place: for example, flashing lights, bells, and gates. A city or town can request to stop whistling. Contact your local municipality office who will work with Transport Canada and the railway operator. Keeping our tracks clear of vegetation is essential to safe rail operations and maintenance. Trees within rail corridors are our responsibility. Trees beside the rail corridor on private property are the responsibility of that property owner. Any overhanging or leaning branches need to be trimmed to help us maintain safe and clear tracks. We share the frustration of local residents that graffiti vandalism is becoming worse and it’s difficult to control what happens in public spaces. We’re committed to removing graffiti vandalism along our rail corridors as quickly as possible. To deter graffiti vandalism, we work with municipalities and organizations, such as neighbourhood associations and Business Improvement Areas on organized community initiatives including the creation of murals and strategic plantings. Fences are a key safety feature to prevent trespassing, vandalism, and graffiti on our property. We’re also looking into more natural barriers, such as shrubs and bushes, to limit access and deter trespassing. In urban areas like downtown Toronto noise walls may be a substitute for fencing. Throwing garbage onto our railway property is illegal and it’s also a safety risk for our trains. We have clean-up programs that take place in the spring and fall. We also work with community groups to keep the tracks clean.